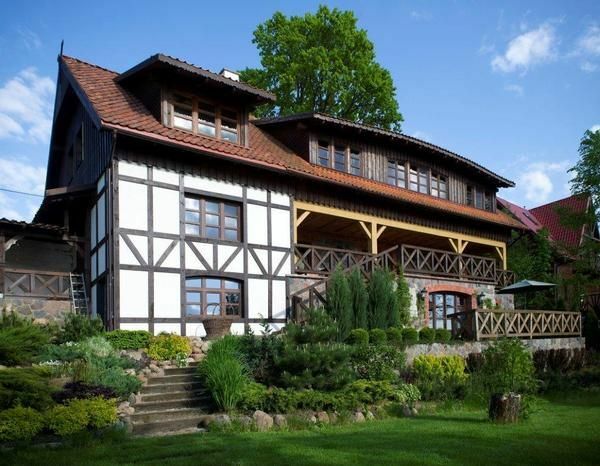 SZARA SOWA is a stylish, rustic villa located in the Gorło Masurian village. The house is located on a slope along Łaśmiady / Ułówki Lake with the shore line of the lake. Pre-war post-German buildings were completely restored and expanded in 2010-2012. We offer our guests a spacious comfortable and rustic furnished holiday apartments and family suites with a view of the lake, a private terrace and direct access to the garden. The apartment has a living / sleeping room with a double bed (160cm), a kitchenette, bathroom. The kitchenette is equipped with a stove, sink, fridge and basic appliances and kitchen utensils. The bathroom has a shower, sink, toilet, bidet and washing machine. On the terrace You can find garden furniture. TV, WiFi. Rowing boat and bikes available. We are open from May to October. Breakfast: per object and day according to consumption (Mandatory). Pet: per object and day Costs amounting to 20 EUR (Mandatory). We are located in a picturesque village in the municipality of Gorło, Stare Juchy, in Elk Lakeland. Elk Lake District is considered a unique tourist region in Europe. Moraine Valley and areas równinne.Jeziora of Stare Juchy are covered by the zone of silence. Ideal conditions for rest and explore the beautiful nature unspoiled by civilization. The perfect place for fishing, sailing, canoeing, mushroom pickers, bikers, hikers, Nordic walking, also winter sports enthusiasts and nature watchers. Gorło is a small village located along the shoreline of Lake Ulowki combined in a team with lakes Lasmiady and Rekaty. Cot for adults (per person and day, to be done by tenant 30 EUR).